Someone today talking about deniers of climate science? Nope. Check out Joss Garman's post on relativity deniers. Hey, Tony Hayward: Wanna Make a Bet? BP CEO Tony Hayward predicts today's "top kill" effort to stop the oil spill has a 60% to 70% chance of success. Look, no one wants to see the gusher stopped more than me. Having seen the spill's devastating effects firsthand, I have trouble even talking about the spill's impacts on communities, people's lives & wildlife without getting choked up. But this is the same Tony Hayward who predicted the spill's environmental effects would be "very, very modest." That "60% to 70%" prediction translates to 2-to-1 odds. If Tony Hayward offered you a bet that another one of his predictions wouldn't come true at 2-to-1 odds, how much would you bet against him? I'd cash in my 401(k). I hope I'm proven wrong & this post looks silly in hindsight. If the oil gusher really is stopped, I wouldn't be embarrassed, I'd be psyched. But an endorsement from Tony Hayward doesn't fill me with confidence. Side note -- for some oil spill comic relief, follow Fake Tony Hayward & BP Global PR on Twitter. June 7: Screening of "The Greening of Southie"
Trailer - The Greening of Southie from Wicked Delicate Films on Vimeo. What Do BP Oil Spill & Offshore Drilling Jobs Have In Common? Nobody can provide an accurate estimate for either one. Even before the Defense Department made known its objections to offshore drilling in Virginia, Bob McDonnell raised eyebrows with a letter he sent to the Interior Department in December. The letter cites a 5-year-old study that predicts offshore natural gas production alone would generate 2,578 jobs in 10 years. That the then governor-elect would quote the study surprised its author, former Old Dominion University President James Koch, who called the document a "flyover from 30,000 feet." "I've told them they shouldn't make too much of something done over the weekend," Koch said. "I don't even put that on my [curriculum] vitae." A 2009 [American Petroleum Institute] study found that Virginia would gain 130 drilling jobs, plus another 291 related to drilling, by 2020. The figures jump to 216 and 415, respectively, by 2030. Only 415 jobs 20 years from now? At the cost of risking this off Virginia's coast? "You have to weigh environmental safety. You have to weigh the significant naval operations and NASA operations off Virginia's coast," he added. "I think a third thing you'd have to weigh in Virginia's case is opportunity cost -- would it be better to do offshore wind? "The same place where you might want to do oil rigs off the coast of Virginia, there's actually pretty favorable wind conditions," Kaine said. "So you would look at all the options and you would put them all on the table, including the environmental conditions. And certainly the need to be diligent about that has certainly been escalated dramatically by what we've seen in the gulf." Tell Senators Mark Warner & Jim Webb it's time to stop letting Big Oil write our energy policies. "I have no connection to BP or any other oil company at all." According to OpenSecrets.org, Rep. Duncan has received $85,111 from the oil & gas industry since 1998. As part of my work with the National Wildlife Federation, I'm now contributing entries to Huffington Post Green. Check out my posts here! The facility was designed by Perkins+Will in collaboration with the engineering firm Integral and builder Bognet Construction Associates. “We wanted a space that would be welcoming and reflect our core values of excellence and respect,” said Free Clinic executive director Nancy Pallesen. Congrats to the Arlington Free Clinic! Sometime last week while I was in Louisiana covering the BP oil spill for the National Wildlife Federation, The Green Miles passed 100,000 visits. When I started this blog nearly four years ago, the environment was what I did to forget about work. I wasn't happy as a local TV news producer covering murder, fires & car accidents, so I began volunteering with Arlingtonians for a Clean Environment, getting involved in Arlington Young Democrats & reading blogs like Raising Kaine (now Blue Virginia). I never imagined it would lead to anyone would pay me to write their blog posts for them. Or that if they did, they'd allow me to keep writing The Green Miles in my spare time with full editorial independence. So I'm thankful that you've kept reading, I'm thankful for what all those clicks have helped me achieve & I'm thankful that even as The Green Miles becomes a comparatively "old" blog I still look forward to posting as often as I can. Finally, a bit of The Green Miles trivia -- all-time most popular post? How to recycle VHS tapes. ... is shaking it all over you. The Green Miles works in the National Wildlife Federation's press office, which means that usually while something fun is going on (like a boat trip), I have to stay behind & take care of calling reporters, writing blog posts, etc. I'd thrown the block of wood for her a couple of times, then realized I needed to get my Flipcam to record it -- because years from now, when I'm having a stressful day, I will pull up this YouTube clip & instantly relax. I went out to my car & came back -- she saw me come around the corner & straightened up like, "I thought you were gone! YOU MEAN I CAN CHASE IT AGAIN?" And if you have to ask what this post has to do with the environment ... you need to get yourself a dog & a stick. One piece of irony: The Coast Guard station is on the same street as a Halliburton location. Halliburton's role in the spill is being investigated. 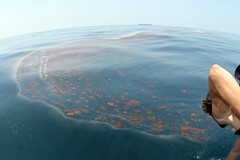 As we watch the Gulf Coast oil spill unfold, a little be perspective on oil's toxicity. Taking a risk that I shall henceforth be known as a dasher of hopes, I’m going to have to give you a “no” on this one. Motor oil residue has become one of the biggest contaminants for our plastics markets. The residue seeps into the porous plastic and cannot be removed through the washing process. Of course you should never try to rinse or wash a motor oil bottle yourself since motor oil down the sink or storm drain causes a much larger environmental crisis than a plastic bottle in the trash. The market representatives who take our plastics tell us a motor oil bottle in a pile of plastics could potentially contaminate a whole batch of otherwise-recyclable materials and cause the whole lot to be sent to the landfill. So, when you look at it, recycling a motor oil bottle would be the real dasher of hopes for all the other bottles that really wanted to be recycled. Considering how toxic just the residue inside a bottle can be, can you imagine what 25,000 barrels a day could do to the Gulf Coast?